With the extremely high temperatures involved in welding, it's vital that you use thick, hardwearing hand protection in order to prevent serious burns. 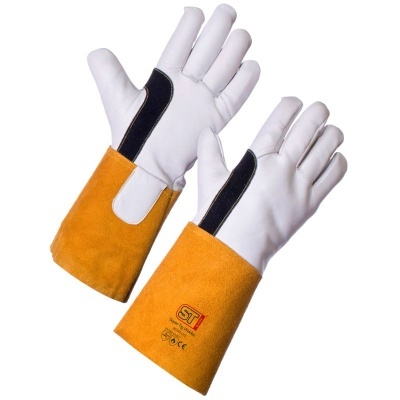 The Supertouch Super TIG Welder Gauntlets 20763 combine full-grain and split-grain leather in a tough, distinctive and heat-resistant design which provides excellent protection for general welding and metalwork applications. The Supertouch Super TIG Gauntlets are supplied in a single universal size that should be suitable for most users. As heavy-duty welding gauntlets, they are designed to have a looser fit than thin precision work gloves.